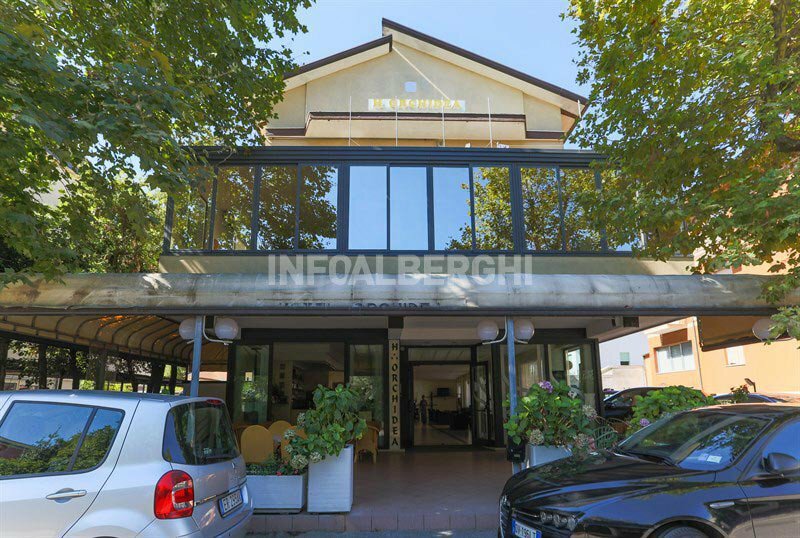 The Orchidea Hotel , 3 stars of Villamarina di Cesenatico with family management, has reserved parking, services for families, free use of bicycles. Accept pets of all sizes. The hotel is located in Villamarina di Cesenatico, a tourist village near the center of the town of Gatteo Mare with which it borders. The property is conveniently located, less than 5 minutes walk from the beach. All rooms are equipped with satellite TV and digital terrestrial LED, WI-FI, telephone for internal use, bathroom with shower and hairdryer. On request: balcony, air conditioning, safe, mini-fridge and breakfast in the room. Large shaded terrace, open-air porch, free bicycles, hall, American bar and TV sat corner, lift. 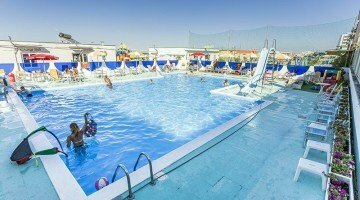 Guests have free access to the swimming pool on the beach of the Village Hotel Cesenatico, with games and entertainment for children. PARKING: uncovered, reserved on request. AGREEMENTS: beach, shuttle service on request. SERVICES FOR DISABLED PEOPLE: entrance and ground floor rooms, lift for the disabled, bathroom with wheelchair-accessible shower. BREAKFAST: sweet and savory buffet, with homemade pastry, bread, cereals, hot and cold drinks. LUNCH AND DINNER: the kitchen is run directly by the owners, with a 3-choice menu of meat and fish, a buffet of appetizers and vegetables. Pasta and desserts are homemade. CHANGES: vegetarian and celiac cooking (both on request). In the hotel: indoor playground area, entertainment, pediatrician on request. In the room: cots, bottle warmers on request. At meals: baby food , baby menu, high chairs, flexible hours. On the beach: entertainment, children's pool, baby / mini / junior club. The hotel has a private beach with a swimming pool, spaces and services for children.